In an up and down game, the Pittsburgh Steelers escaped San Diego with a 24-20 victory. Michael Vick was clutch down the stretch; Markus Wheaton and Darrius Heyward-Bey made key plays. But, the man of the hour was Le’Veon Bell as he is once again the Steelers Gab Player of the Game. 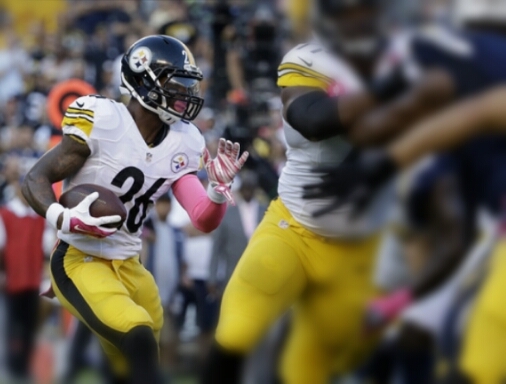 Bell showed once again Monday night that he is the best running back in the NFL. His vision, and quickness, was too much for the Chargers defense to handle. On the last play of the game, it was Bell’s second effort that made the difference. Bell looks to be in full swing now and his touches should increase against the Arizona Cardinals. With Vick finally turning the corner in this offense, expect Bell to make more big plays as the defenses will be forced to spread out more in the coming weeks. More running lanes for Bell means more touchdowns and hopefully more wins. His 111 yards on just 21 carriers is a testament to his efficiently. Many consider Bell to be the best running back in the game. After his Monday Night Football performance, I’m sure more are saying and thinking just that. 1 Comment on "Steelers Gab Player of the Game: Bell Is The Answer Once Again In Week 5"
In honoring Bell for the final TD, Steelers Gab got it wrong. Bell played well, but the accolades belong to the Steelers defense and particularly Heyward and Tuitt who put pressure on Rivers consistently all night and provided the offense with one last attempt to score. Which is more worthy, a single goal-line play, or an entire evening of work that makes that one play possible and meaningful?